Грешката се получаваше винаги на последната стъпка: след попълване и проверка на декларация, когато идва време за полагане на последния е-подпис, вместо такъв получавах съобщение “Грешка при подписване. Код на грешката: 8”. Без значение на браузъра, по един или друг начин подписването се проваляше! Трябва да призная: не много информативно съобщение! Виждах го и при годишната ми данъчна декларация, и при тримесечните декларации по чл. 55. По-интересното в случая беше, че е-подписът на Веси работеше без проблем на всички машини, на които моя подпис даваше тази грешка. И двата ни подписа са от Инфонотари, и двата са с тригодишна валидност, но нейният работеше, а моят – не! Много несправедливо! Две тримесечия подред се опитвах да оправя тази грешка чрез поддръжката на сайта. Не успях: налагаше ми се да използвам помощта на колежката, която ни прави заплатите, за да подам декларацията на хартия. Като изключим това, че я занимавах с моите лични проблеми (което не ѝ е работа), беше ме и срам, че не мога да се оправя. Последното тримесечие реших да попълня и приготвя декларацията възможно най-рано, за да имам време да реагирам и да “мъча” поддръжката на НАП максимално, за да реша този проблем. И се оказа, че успях да попадна на човек, който да ми реши проблема. За разрешаване на проблема направете следното: рестартирайте браузъра след което изберете отново въпросната услуга и когато ви излезе прозорец за избор на сертификат маркирайте сертификата с който ще подписвате документа и натиснете бутона “Хранилище на Windows…”, който се намира в долната част на прозореца, след което продължете по обичайния ред нататък. Честно да ви кажа, подобен отговор ми звучеше доста неубедително. Но е факт, че след като описах магическите действия (между другото, бутонът “Хранилище на Windows…” не направи нищо, аз очаквах да видя поне някакъв прозорец като резултат), браузърът взе, че подписа. Не знам какъв му е бил проблема, не ми обясниха това. Но магията работи. Затова оставям това тук, за мои бъдещи нужди, както и за някой, който има същия проблем с проклетата “грешка 8”. Today I had to create a bunch of Outlook 2016 appointments in my calendar. I wanted to avoid as much as possible the manual, one-by-one creation of the items, so I decided to lurk around for a method, which would allow me to do this work easier. Quick Google search led me initially to the article “Create Appointments Using Spreadsheet Data”, which was showing up how this can be done with VBA macros. Although this was cool, programmatic way to accomplish the task, I was looking for the KISS principle method: just plain CSV import. A bit more search and I was all set. The article “How to import a Calendar from Excel to Outlook” described quite straight forward process. However, I found a few discrepancies from what was desrcibed there, so I decided to sum up the differences I encountered, so the next time it’d be easier for me (and probably for my readers) to accomplish this task with Outlook 2016+. The first difference was that there’s no XLS import in Outlook 2016. I had only CSV. This made useless to define namespace (as the article suggests), because CSV does not export that information. Subject, Start Date, Start Time, End Date, End Time, All day event, Reminder on/off, Reminder Date, Reminder Time, Meeting Organizer, Required Attendees, Optional Attendees, Meeting Resources, Billing Information, Categories, Description, Location, Mileage, Priority, Private, Sensitivity, Show time as. If you save the above code fragment as CSV, the import in Outlook 2016 would be pretty straight forward. It’ll create an all day event with title “This is All Day Event”, marked as Out of Office, on Jan 15, 2017, with category name “MyCategory”. Except from this, the data was correctly imported there too. Few weeks ago a very close and trusted friend of mine (thanks, Atanas 🙂 ) sent me a link to this excellent iClever Bluetooth travel keyboard . As I was already quite in need for pocket, travel keyboard, it took me only 5′ to review and purchase it from Amazon.co.uk. I own the thing since a few weeks and every time I use it to do my typing (i.e., type on the tablet an e-mail, blog post or whatever longer), I’m quite delighted what a good solution this keyboard is to my typing need. The keyboard is small when folded up, but it’s large enough to allow hassle free typing with both hands. It has very smart (and I hope – strong enough to ensure long living) folding mechanics, which allow transformation from its “working size” to “pocket size” in a second. It also has a pouch, which not only protects the keyboard while folded, but also protects the other items the keyboard is close to in the bag, as it’s aluminum body, which could otherwise scratch another sensitive item in your bag (i.e., your phone or tablet). The keyboard also has four silicone tips, which make it almost stick to the surface while I’m typing. This is a feature, which I like a lot, because most of the pocket keyboards (or at least those I had my hands on) lack this and you need to always relocate the keyboard, which (naturally) moves as a result of your action on the keys. Thanks to these bands, the keyboard stays very solid on the surface you put it on. I’m using the device with an Android tablet. However, the manufacturer claims that it should work with Windows and iOS too (it has Win key indeed), but I never tried that myself [yet]. Setup is pretty much out of the box: you turn it on (turns on by unfolding), long press the “Bluetooth link” button, pair and you’re good to go. My only trouble was with the fact that I’m Bulgarian Phonetic user and the default Android hardware keyboard settings do not include this keyboard layout. However, FDroid and the Phonetic Layout for External Keyboards resolved this perfectly. Honestly, I’d be pretty screwed, if this was not existing, so thanks guys (modest donation is on its way!). 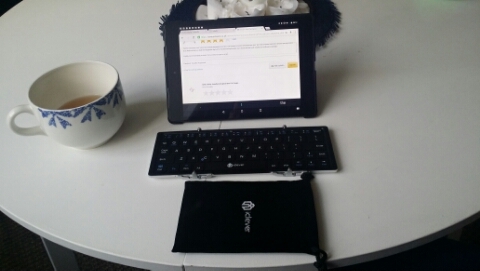 Below is the picture of the keyboard, which I made for my Amazon review. It stays next to Nexus 9 tablet, so you get the idea of the size when unfolded. The pouch is next to it, i.e. this is the size of the keyboard, when folded. The thickness of the folded keyboard is not more than 10-14 mm. I highly recommend this thing to anyone, who carries on tablet and has typing needs, which are best served with a keyboard. This blog post was, of course, typed with this keyboard. I am sure this title lighten up few smiles in my dear Windows Phone and iOS fans :). But no, don’t be in a hurry, it’s not what you’re possibly thinking. I started today to analyze my Note 3 applications, using My App List application. One of the features of this application is to create an extensive list of the (additionally) installed applications on your device. The main reason to go in this direction is the fact that something is wrong with my Note 3 after it came by from the deep freeze, which my iOS experiment has put it into. During the experiment I was pretty mad from the bad performance of the iPhone battery, but since then the Note 3 battery runs pretty quick and the device is constantly hot! Its like I’m being punished for my harsh words about its fruity colleague! GSam Battery Monitor reports main “juice user” (averaging 60-85%[!]) is the system’s gsiff_daemon, in which we have tons of system (including user!) services running. Since I’ve never succeeded digging into gsiff_daemon process (I doubt this is possible at all, and even it it’d be possible, it’d require root, which I won’t do to my Note 3), I decided to check up what’s installed on the device and (eventually) to through full reset cycle this weekend. That’s how I ended up with My App List, a really nice piece of software, which does this enumeration for you. As you can see, this is quite substantial installation base, which I’ll most probably have to reduce. I’ve already uninstalled applications like BatteryGuru, AccuWeather, LinkedIn, Cover, which I was suspecting could eat up battery because of bugs, but the situation did not really improve. To be honest, the situation did not get worse as well, which would be strange, since BatteryGuru promises precisely that: saving battery life. However, I assume that the drain is so bad that the eventual savings from Battery Guru are not significant to mention. The next step will be to completely wipe the device (don’t forget to pull out the SD card first! ), and then to see what’ll happen. I’m very sorry that I will have to redownload ~5GB of Spotify lists, but nothing can be done to help that: the SD card will be copied, and then the card itself will be formatted via the Android, to ensure that it is not in a supported, but not so well tested filesystem. I am very eager to see how this goes on. My Note 3 has not been wiped since I got it last October, and this is way too long time for an Android installation (it’s like the old Windows 98: if you use it too much, you have to wipe it out from time to time). Time will tell. For now, I’m struggling with the thought how it’ll go, while I’m waiting 1 day with the stock Note 3 software, without any additional things but my accounts setup… I have a lot of account, so I’m assuming even that could easily put the device in the same state as it’s now (i.e., draining battery way too quick), but without check we can never be sure. Weekend is approaching, I’m anxious! Защо, ще попитате? Причината: ще взема за лична употреба един iPhone 5S. Досега много устройства на тази компания са минавали през мен, но винаги са били предназначени за колегите от фирмата, или за приятели. Личното ми отношение към тази технология е изключително негативно, поради ограниченията, които Apple налага на своите потребители и екосистема от разработчици, както и по “твърде американския” начин, по който са направени нещата там: има един начин да свършиш нещо и той е свещенния начин и Волята Епълска не подлежи на коментар (т.е., малко “тука е така” парадигмата, която ми е много дразнеща). За пълен провал на експеримента (и на волята ми) ще приема ситуацията, при която изоставя айфона по-рано от 08-10 август 2014. Или ако видя, че в крайна сметка пак си използвам удобния ми Андроид. Междувременно ще се опитам и да си водя бележки тук :)… за моя поука. Засега Samsung Galaxy Note 3 телефона ми ще остане активен, винаги зареден и готов да поеме мизерия, която би се получила, ако iPhone-а ме издъни. Но ще се опитам да го заровя така дълбоко в чантата, че да не се изкушавам лесно да го грабна и да се възползвам от невероятното удобство и гъвкавост на Андроид платформата. Т.е., ако видите да ви звъни непознат номер, може и да съм аз :). Вие си ми звънете на моя номер, той ще е пренасочен винаги към правилното устройство. Предполагам, ще минат 1-2 дни, докато успея да направя пълна и успешна настройка на системата. Важни неща като фирмена поща, календари (не, няма да използвам iCloud засега), лична поща, контакти… абе много работа! Най-вероятно до тогава ще използвам двата. След това обаче… дупе да ми е яко! Recently, I red in my fellow hosting provider Superhosting.BG about global, worldwide bruteforce attack over a lot of WordPress blogs (post in Bulgarian). I decided to quickly check what’s the actual attack activity and I installed the Limit Login Attempts WordPress plugin. What this plugin does is it logs all incorrect login attempts, and if they go above given treshold, it blocks the IP for a while and logs the blocking. After few blockings, it blocks the IP for a day or so. Obviously, there was some “unhealthy” interest. But I never expected that the scale would be that big. And they were all shooting for “the big fella”, the “admin” account. So it was time to change the admin username. Obviously, the success factor of the attack is based on the fact that WordPress comes with default “admin” username. If I change the username to something else, the attack would never succeed, even if it by some crazy stupid chance succeeds to get my password right (12+ symbols password). It was pretty quick change, although I had to play with the database directly (I’m almost sure there’s a plugin to do the job as well). Now all seems safe. My wordpress applications locked my account twice, until I realized that I have to change the username there too, but that was the only harm so far. So, if you’re managing WordPress blog, I urgently advise you to install Limit Login Attempts and change your admin user password (if you have only one admin user, if you have many, you have to live with the plugin only). Otherwise, you’re pretty much exposed to (some) risk, especially if you have easily guessable WordPress admin password. Не знам дали изисква рестарт, май не, но не съм 100% сигурен. И не забравяйте: всяко бърникане из Windows Registry може да ви скапе тотално и невъзвратимо компютъра. Ако не знаете какво правите и не сте готови сами да поемете този риск, недейте след това обвинява автора на този блог . Днес ми светна къде и какво миналата седмица ме е обърквало, че да не мога да си настроя Facebook Connect плъгина! И като ми светна, всичко взе че тръгна от раз. Какво точно беше ще пиша на английски, в следващ пост. Сега накратко искам да помоля всички коментиращи, освен стандартните “common sense” правила, да спазват още едно – ако ще коментират, да го правят през Facebook акаунта си, ако имат такъв. Само 2 клика е, спестява писане по поленцата (ако вече ги нямате), а е много удобно. Всички останали, които имат акаунт в моя блог, може да си “вържат” акаунта с техния Facebook акаунт, за да им е още по-удобно при коментиране. Някой пак ще изпищи, че само за това пиша, ама какво да се прави, като трябва да имам хронология 🙂 ? Остава ми да си преработя банера от старата тема, защото без банер не ми изглежда много читаво. И май това е… освен ако нещо не съм забравил, за което разчитам и на вас. Граватар е включен, но нещо граватари не се появяват, лоша работа, много ми харесват и ще трябва да ги прибавям ръчно, някой ден.